I remember what it was like back in 2009. I was so new to freelancing that I couldn’t have given you a succinct definition of it. Like a freshly-hatched bird, forcibly pushed from the 9-to-5 nest, and I had no clue how to fly—or rather, how to run my own business. My so-called “business” was an assortment of No’s: no website, no Facebook page, no business cards, no business name. My old boss had laid me off on a Friday. He called me on Monday. He said he couldn’t finish the projects I had been in charge of while on his team. He needed to re-hire me, only as a freelancer. That first freelance writing project was a pressure release valve, for sure. And it’s not like I had other leads. I pounded out the web content, press releases, and ad copy at local coffeeshops. That suited me just fine. The first problem, the first No in my business, didn’t become apparent until I needed to invoice the creative director. I had no freelance writer invoice template. I thought what every smart, talented, ambitious writer thinks: “Uh….” I had never sent an invoice in my life. “Invoice” sounded awful business-y, and I tended to shy away from things business-y. I was a writer, after all. An artiste! That mindset, as well as my avoidance, at least in the early days, of business fundamentals, caused me to make mistakes. I’ll help you navigate the nefarious freelance writer invoice. Today, I’d like for you to learn from those mistakes. I’m going to share my rationale for freelance writer invoices. There’s more to them than you might think. You may find the business side of freelancing confusing or intimidating. I certainly did! Or maybe you have found your writing clients through bidding sites. You’re ready to transition your freelance writing business to private clients. Upwork and the other marketplaces took care of all the time tracking, invoicing, and payment processing for you. Now you need to figure out your own standalone system. Even if you don’t yet have private clients, it’s better to be prepare now than to scramble to save face later. When that awesome new client asks for an invoice, you’ll already have a rock-solid template on file. These uncharted waters call for contracts and freelance writer invoice templates. Unless you’re a pack rat and tend to hoard business-y “collateral,” you may find yourself without an accurate map and sextant, so to speak. Let’s get you set up with the right tools and tactics. I’d like to put your fears to rest and help you learn the ropes. Even if your clients typically handle contracts and invoices themselves, you’d do well to learn the basics. Why is an in-depth article about freelance writer invoices worth your time? If you’re anything like me, you love writing. And you like the idea of getting paid to write. Those two things, love and alignment, propelled you into freelance writing. But understanding the mechanics of a good blog post is a far cry from being a shrewd businessperson. In fact, we’re talking about two different skillsets—a dog versus a cat. For you to require a down payment before you start writing? Normal. For a client to ask you to start working right away while they process your invoice? Normal. But I’d politely refuse. They must pay to play. For a client to ask you to do a small project before they pay you anything so that they can evaluate whether you have the right skills? Run away. The more you learn about the business side of freelancing, the fewer weird situations you encounter. Allow me to translate: Sidestepping “weird” means that you end up getting paid more often and getting frustrated less often. You want to write. You want to get paid. Getting paid requires invoices. Becoming an expert with invoices, as well as the other parts of your business ecosystem connected to them, will take you full circle back to your first love: writing. Let’s start with the basics. Humor me. A receipt is what you get after you have paid. You get a receipt at a restaurant. During tax season, when you’re preparing your return, you may receive a 1099 from each of your clients—at least if you live and work in the United States. The amounts cited on those 1099s should match the total of the invoices that you sent. After your clients report that total amount to the IRS on their tax returns, they keep your invoices (that is, the paper trail) on file to prove that you performed services and that they paid you for them. When should freelance writers send their invoices? 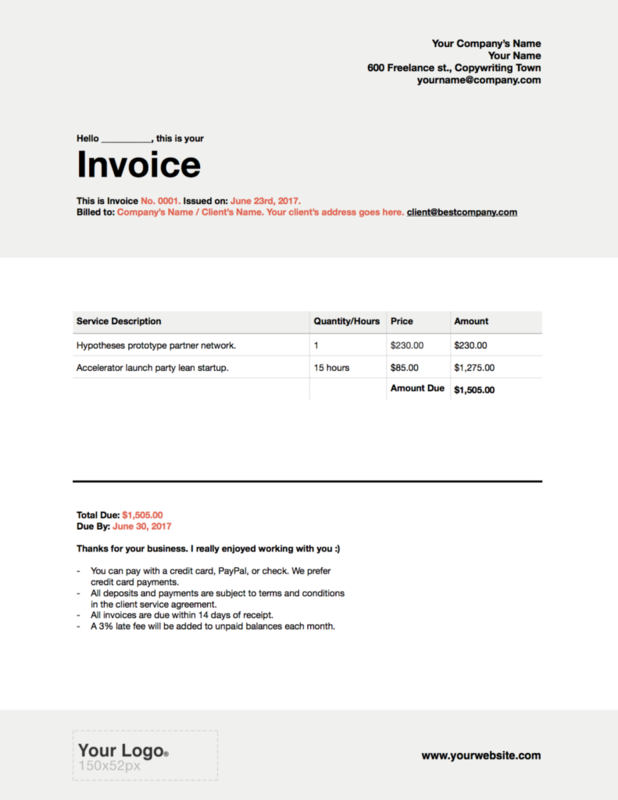 You can send invoices before, during, and after a project. I always require a down payment (that is, a non-refundable deposit) for each project before I get started. So I will send that invoice on the heels of the Client Service Agreement (CSA). In my CSA, I will break up the outstanding balance into milestone payments or an amortized amount per month based on the project’s expected duration. For example, if the project total is $6,000, then I will require a $3,000 down payment. The remaining $3,000 I will break up into two payments of $1,500 due at 30 days and 60 days. So I will send three invoices: one before the project and two during the project. If the project stretches past 60 days, that is fine with me. The client has already paid me in full. What are the best ways to accept payments online? Some confusion surrounds this question. Most freelance writers ask how to accept payments online without knowing that the question is a rabbit hole. As soon as you ask about merchant services, you might as well be Alice. For example, FreshBooks is cloud-based accounting software. Along with Xero, FreshBooks is a direct competitor of QuickBooks. All three will have comparable feature sets. But we’re not finished complicating matters. A slew of other web and mobile apps have carved out their own pieces of the payments and accounting pie. Freckle focuses on time tracking. Harvest (affiliate link) focused on time tracking, invoicing, and payment processing. Harpoon focuses on time tracking, invoicing, payment processing, and planning. But back to the original question—I accept two primary payment methods: PayPal and Stripe. Some clients prefer the ease of PayPal payments. They already have PayPal accounts, so they can click on the invoice link, click on the PayPal button, and finish the transaction within a minute or two. Stripe, my other accepted method, handles all of my clients’ credit card payments. Setting up an account is free, and processing fees vary depending on your sales volume. The baseline is 2.9% plus $0.30 per transaction. PayPal’s fee structure is identical. The FreshBooks fees are too: 2.9% of the transaction total, plus $0.30 for Visa and MasterCard and 3.5% plus $0.30 for AMEX. You can bill clients outside of the U.S. and Canada with FreshBooks, but you will have to charge them in USD or CAD. As a result, their banks may charge them currency conversion fees or foreign transaction fees, even if they pay the invoice with their local credit card. On the other hand, Stripe processes payments in over 135 currencies. You can charge clients in their “native” currency yet still receive payment in yours. The bottom line is that you should give clients more than one payment option, and I prefer Stripe and PayPal, with Payoneer as a third option that I keep in my back pocket. Freelancers in Eastern Europe and 200 countries around the world often have difficulty receiving payments from other countries. Payoneer stepped onto the scene and made a splash by lowering fees, processing payments faster, and offering greater flexibility. My illustrator in Macedonia uses Payoneer to request payments from me. Freelancer writers in Canada and the United States take certain financial products for granted—namely, credit cards. But what many freelancers live in countries like Tunisia where they simply cannot get access to an international credit card. Payoneer figured out how to enable freelance marketplaces to transfer funds quickly and securely to more than 200 countries and in over 150 currencies. And at a reduced cost. I’m a fan. Should freelance writers try to avoid credit card processing fees? Can’t you make more money if your clients mail you a check? I honestly believe this is a losing battle. Several years ago, I hired a designer to help out with the UI/UX for an iOS app. In terms of quality, her work was 100% on point. No complaints there. When it came time to settle up, however, the designer sent me an invoice attached to an email. I asked if her business email address was the same one she used for PayPal. My intention was to pay her right then and there. She asked me to mail a check instead. She said that she didn’t want to lose the 3%. At first glance, this request is innocent enough. It’s not like writing a check, addressing and stamping an envelope, and walking out to my mailbox takes much time—five minutes at most. Yet, I still found the request irritating. I had stated that my preference was to use PayPal or pay with a credit card. I asked for that convenience because I had a hundred other things I needed to do that day. But my designer didn’t see it that way. She wanted the 3%. Call me petty, but that little exchange negatively impacted my perception of the designer’s professionalism and generosity. Her work was fantastic, but the last tiny sliver of the project, the part that any client remembers most vividly, made me think that she would rather waste my time for 3% than make it super easy for me to pay her quickly. I’m not saying your clients think like me. I’m not saying that YOU should think like me. But I am saying that, like me, your clients have other options. If you want to have first right of refusal on their best writing projects, then you should make doubly sure that you’re not handling invoicing and payments in a way that makes a withdrawal from the client’s good graces. Relationships die by a thousand cuts. To keep them healthy, you must protect the client experience every step of the way. Offer more conveniences, not fewer. Why do I, as an experienced freelancer, prefer to receive credit card payments? Because I want the money now. Because I don’t want to wait. Because I have bills to pay right now. Because I don’t want to give my clients a chance to change their minds. Because clients often prefer to pay me now, while they’re thinking about it, while they have the cash on hand, while they have that credit card in hand. Once they pay, the project has commenced. You can get to work. They can think about other things—things that do NOT include delaying the payment, paying someone else first, or putting the kabash on the project. Eat the 3%. Write it off on your taxes. Mark it up as a convenience fee you’re willing to pay so that your clients have no reason to hesitate. Strike. while. the. iron. is. hot. Now for practical solutions. In her article “How to Get Paid Online Without Losing Your Money or Your Mind” Sophie Lizard shares a simple way to get out of this credit card fee pickle: Pass on the cost to your client. 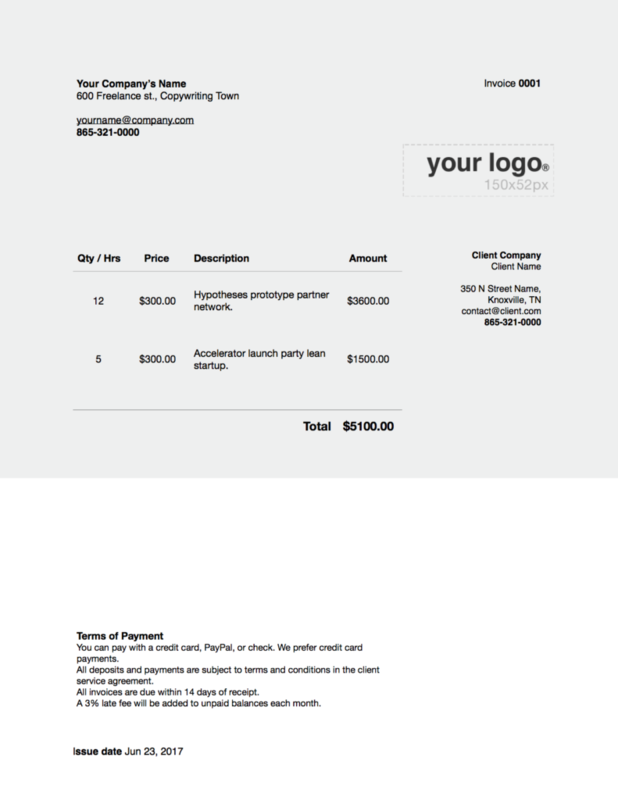 How do you send your freelancing invoices? I use a web app called Harvest (my affiliate link) to send invoices. Because I use the Harvest iOS and Mac apps to track my time, I can easily include an itemized report of time spent in each invoice. Or, if I need to create an invoice for a down payment on a new project, I can set up a new client and new project in a minute or two. All of the major cloud-based accounting apps, including FreshBooks, Xero, QuickBooks, and Wave Accounting, enable you to send invoices. And the other niche apps like Harvest, Harpoon, and Ballpark do as well. However, many writers create their invoices manually, one at a time. They print the Word, Pages, or GDocs document as a PDF. They attached the PDF to an email, and deliver it to clients that way. How you deliver your invoices depends upon whether you want to pay a monthly fee for a web app like Harvest or you want to save money by using a freelance writer invoice template. What pieces of information go into the invoice? 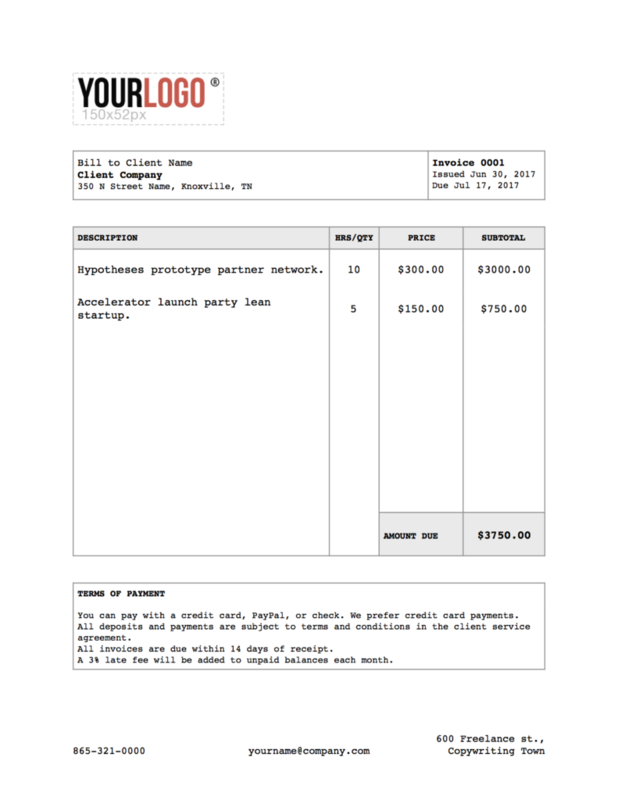 A screenshot is worth a thousand words, so below is an example of a freelance writer invoice that I asked my designer to create. Notice how basic the design is. Remember the purpose of the document: You are requesting payment, and you are creating a paper trail for yourself and for your client. An invoice is a record of a business transaction. It is not the Rosetta Stone. It is also not a ripe opportunity to show off your avant-garde design aesthetic. Keep it simple, and you will thank yourself later because there will be fewer things in your template to break. Time is of the essence in freelancing, and if you’re going the manual route, you want to be able to create and deliver new invoices quickly. People flinch when money becomes the topic of conversation. So when you send an invoice, consider how your client will receive it. Even if you already agreed upon price, even if she already signed your Client Service Agreement, you still want to make it crystal clear that your invoice contains no funny business. Leave nothing up for interpretation. Some pieces of information the accounting department needs in order to track the flow of money: Invoice From, Invoice For, Invoice Number/ID, Invoice Issue Date, and Invoice Due Date. 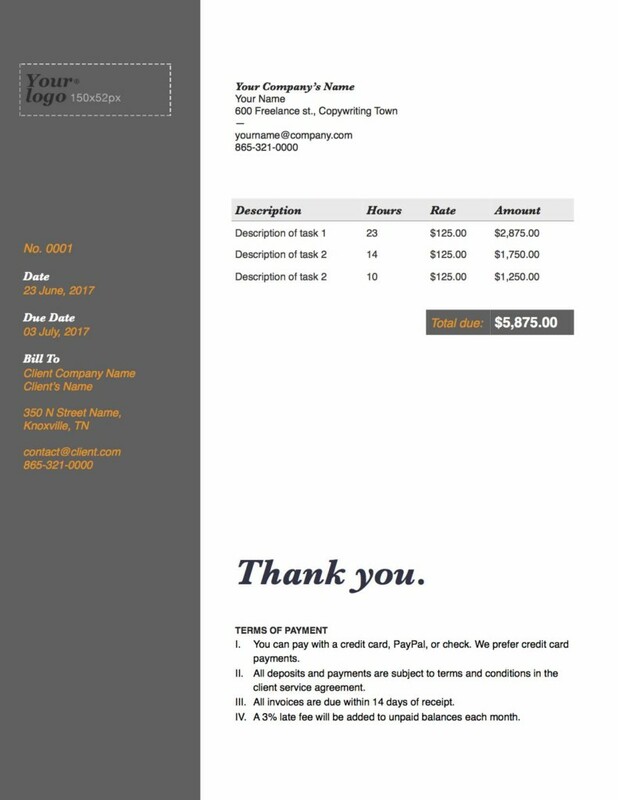 Other sections reassure the client that your written and verbal agreements did, in fact, make the leap from your conversations into the invoice: Item/Project Type, Description of Item/Project, Quantity (optional), Price, Amount, and Total Amount Due (if the invoice has more than one line item). A couple of other sections help to set clear expectations. For example, you can add Payment Terms. Your Client Service Agreement should cover those terms in depth, but let’s be honest: People sign legal documents without reading them ALL THE TIME. It’s thus a good idea to add the most important ones in the invoice itself. Or, “This is the first time I’ve seen these terms.” You want to position yourself to call B.S. because that’s exactly what such misdirection is. So adding your terms in brief at the end of your invoices will help to encourage good behavior. You can pay with a credit card, PayPal, or check. I/We prefer credit card payments. All deposits and payments are subject to terms and conditions in the Client Service Agreement. A 3% late fee will be added each month to unpaid balances. We’ve all got to start somewhere, and back in 2009, I did what most freelance writers do. I performed various Google searches, found some freelance writing invoice samples, Frankesteined together my own, and shipped off that stinker to my clients, hoping I didn’t come across as a total amateur. 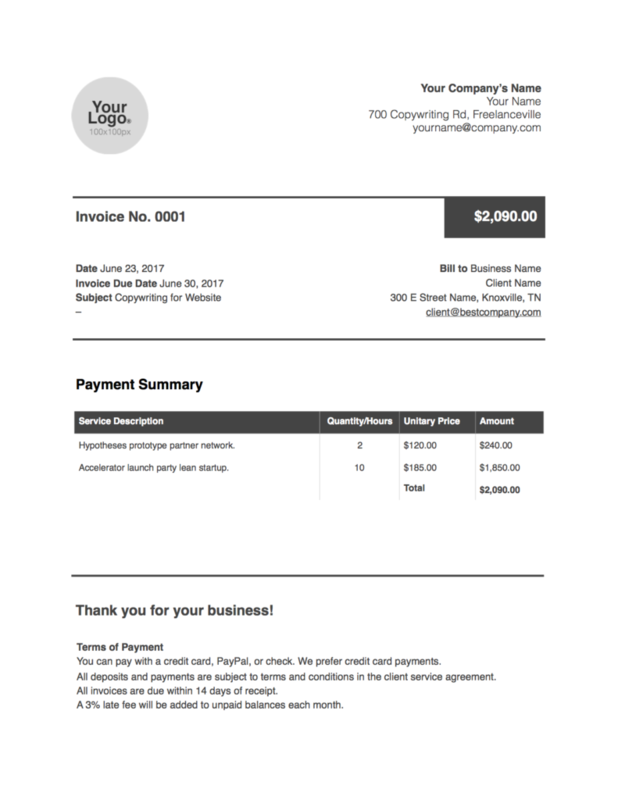 Are you looking for a sample freelance writer invoice template? 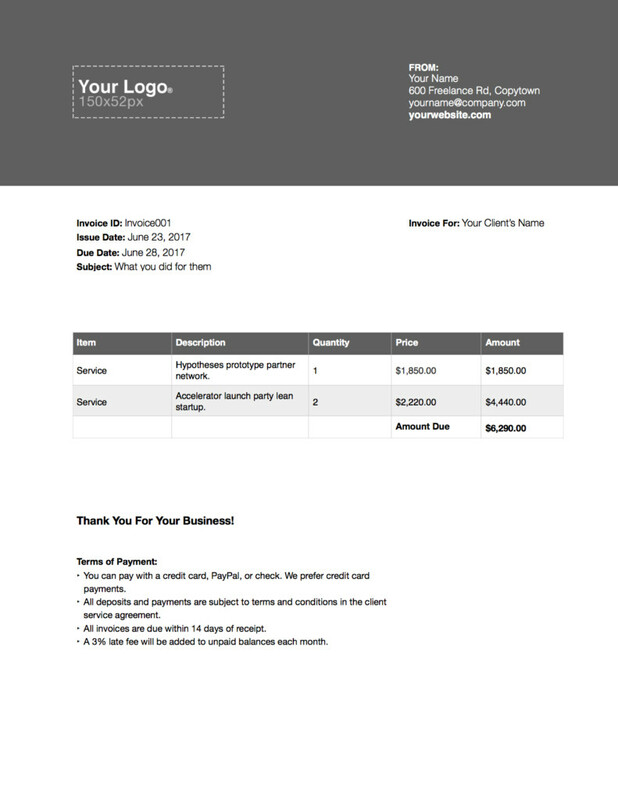 Download this freelance writing invoice template for free. Some of you don’t care enough about design to want to pay for these five premium templates. That’s fine. Help yourself to the free template above. But for those of you who want to add a sprinkle of pizzazz to your invoices, I’ve got some ready-made templates that you can duplicate with ease. Again, if you’re already using QuickBooks or Harvest, you don’t need these templates. They’re for people who manually create their own. You have two options: Premium and Basic. The Premium package contains 5 templates for Microsoft Word, Mac Pages, and Google Docs. The cost is $11. The Basic package contains the same 5 templates for Microsoft Word. The cost is $9. I hope you enjoy the names. I picked some of my favorite writers. You can check out the screenshots below. If you’ve read this far, you deserve a cupcake and a hug. Or better yet, maybe you’d like a free list of 422 sites that pay writers. Enter your name and email address below, and I’ll send you the download link via email. Want the list of 422 websites that pay writers? Share your name and email address, and I'll email you the list.